Breton (/ˈbrɛtən/; brezhoneg [bʁeˈzõːnɛk] ( listen) or [brəhõˈnek] in Morbihan) is a Southwestern Brittonic Celtic language spoken in Brittany. Stephens, Janig (1993). "Breton". In Ball, Martin J.; Fife, James. The Celtic languages. Routledge language family descriptions. Abingdon; New York: Routledge. pp. 349–409. ISBN 978-0415280808. Schrijver, Peter (2011). "Middle and early modern Breton". In Ternes, Elmar. Brythonic Celtic – Britannisches Keltisch: From medieval British to modern Breton. Bremen: Hempen Verlag. pp. 359–430. ISBN 9783934106802. Schrijver, Peter (2011). "Old British". In Ternes, Elmar. Brythonic Celtic – Britannisches Keltisch: From medieval British to modern Breton. Bremen: Hempen Verlag. pp. 1–84. ISBN 9783934106802. Ternes, Elmar (2011). "Neubretonisch". In Ternes, Elmar. Brythonic Celtic – Britannisches Keltisch: From medieval British to modern Breton. Bremen: Hempen Verlag. pp. 431–530. ISBN 9783934106802. Ternes, Elmar (1992). 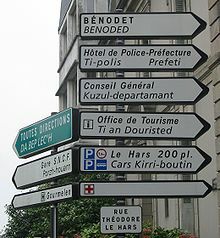 "The Breton language". In MacAulay, Donald. The Celtic languages. Cambridge language surveys. Cambridge; New York; Oakleigh: Cambridge University Press. pp. 371–452. ISBN 978-0521231275. This page was last edited on 24 March 2019, at 03:18 (UTC).